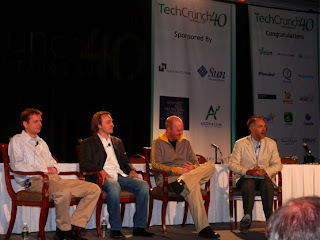 Attending TechCrunch in San Francisco. Arrived a bit late (lunchtime) from Singapore, but caught the tail end of an interesting keynote session with David Filo (co-founder Yahoo! ), Chad Hurley (co-founder YouTube) and Marc Andressen (founder Netscape and Opsware, co-founder Ning). I am shooting video which I will upload and share at some point. Met Marissa Mayer (apparently Google is going to present a new product here) and thanked her for her support of iX Conference in Singapore. She had recommended Douglas Merrill as a keynote for iX, and he did a fantastic job. - Mark Zuckerberg announces a US$ 10m fund called FB Fund (backed by Excel and Founders Fund) - they will grant (not invest) 25-250k in companies that are creating applications for the Facebook platform (send email to 'platform@facebook.com'), wow! 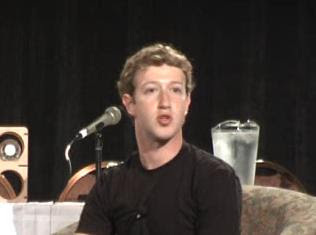 Here's a video recording of Mike Arrington's chat with Mark Zuckerberg. It's in Windows Media, and lasts 40 minutes. The audio quality is a bit poor (no audio feed, just the camera mic).